Watching Wimbledon gets better with this playful Lavazza commercial (“Enjoy the real Italian espresso experience at Wimbledon” reads the tagline). Take a look, it’s very clever. If you are up at 4 am to catch the finals this week, Lavazza- a big Italian coffee brand in Italy found in many parts of the world – makes its case to be your espresso of choice to cozy up to. (North Americans can take note of the cup and portion size.) When I can’t find Lavazza stateside, Illy and Peet’s Espresso Forte stand in quite nice. What’s your favorite coffee brand and style? Nothing is sweeter for me than the intersection of clay court tennis and Rome, Italy. Today Rafa Nadal won the 7th Internazionali BNL d’Italia (Rome Masters) title defeating Roger Federer 6/1 6/3 in 1 hour and 9 minutes. 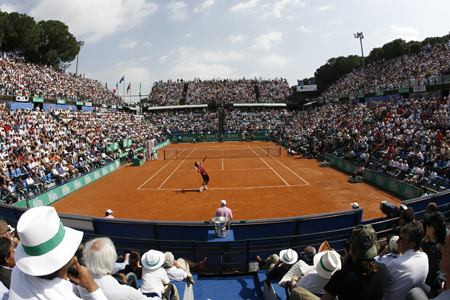 The Rome Masters (officially called the Internazionali BNL D’Italia) is held at Foro Italico, the most prestigious red clay tennis tournament in the world after the French Open. Tennis lovers pack the stadium. The spectators are given white Panama-style hats and paddle hand fans to beat the heat – a chic touch for a mostly Italian and fashion-loving audience. Clay courts are found mainly in Europe. When I lived in Italy, I took lessons and played at the clay courts of Rimbalzello near Gardone Riviera on Lago di Garda. Italians are crazy for tennis although the sport is a bit “snob” with limited public access to free courts like in the States. Europhiles have huge opportunities to combine both travel and tennis. The European tour features matches in Spain, Germany, Italy and France. You can also go there virtually. I recently subscribed to tennistv.com for a little over 16 euros a month to watch matches live on my computer. This morning I got a special treat listening to Nadal speak quite good Italian during award presentations (Bravo Nadal! ), as well as to the Italian judges and award presenters. Language lovers will appreciate this aspect of Tennis TV, which also offers some nice video clips on European life. What’s next? Brussels, Nice, Strasbourg. Then clay will turn to grass with June’s Wimbledon. Non vedo l’ora!